Aoun blamed for the FPM-LF divorce: Is the Maarab agreement dead? The war of words between , Samir Geagea, leader of the Lebanese Forces and FPM leader Gebran Bassil continues and a divorce appears imminent. Maronite Patriarch Beshara al-Rai who is trying to mediate a truce between the 2 Christian leaders stressed Tuesday that internal unity is a priority. “What we care about is internal Lebanese unity… and all Lebanese must reconcile for the sake of their unity,” al-Rai said after talks in Baabda with President Michel Aoun, Bassil’s father-in-law. According to media reports MP Ibrahim Kanaan of the FPM and caretaker Information Minister Melhem Riachi of the LF would soon “meet in Bkirki” in a bid to contain the growing disputes between their two parties. 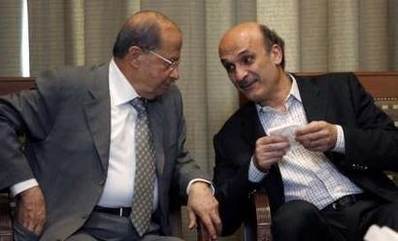 Geagea stressed on Monday. that his party “adheres” to the agreement and will do everything that can be done to save it, An Nahar daily reported on Monday. “I do not agree with the fall of Maarab agreement although I sense the enormity of what happened in the last four days. It is very unfortunate and reflected negatively not only on the Christian situation, but also on the country which needs efforts be put together instead of dispersing them,” Geagea told An Nahar. The LF leader assured that he will exert all efforts needed to “rearrange” things for the country’s interest. “It is unfortunate. I will exert all my efforts in order to rearrange things as soon as possible because the public interest requires that. But I have two or three remarks to make,” he added. The FPM-LF relations have been strained over Cabinet shares. The LF insists on allocating five ministerial seats in addition to the deputy Prime Minister post which the FPM categorically rejects. The LF leaked the highly confidential agreement to the media in recent days amid bickering with the FPM over the share that each of them should get in the new government. “Maarab Agreement has become a thing of the past that we won’t return to. We can interact with the LF in the government and according to clear standards, but maybe a new and clearer agreement would be reached,” added the source on condition of anonymity. “In principle, we can not deny the representation of anyone. But the basics of Cabinet formation must be respected mainly the sizes (of parliamentary blocs), the outcome of the elections must be respected,” he added. “I feel sorry that Lebanon is currently witnessing the tenure of a President that accepts to relinquish his powers to another person,” Katisha told Asharq Al-Awsat. The MP warned that by shifting his presidential powers to his son-in-law, President Aoun would take the country to a big political crisis. “Continuing to hinder the birth of the new government would bring about an economic breakdown, with uncalculated negative results on Lebanon,” he said. “Bassil is trying to minimize the LF ministerial representation, to control the Mustaqbal Movement and the PSP by imposing Sunni ministers on PM-designate Saad Hariri and Druze ministers on leader Walid Jumblatt and to contain all other political elements that could contradict his aspiration for hegemony,” the MP said.